The 10th season of South Park will open in the US on Wednesday with a new episode featuring Chef, days after the departure of soul singer Isaac Hayes. It will dispel speculation that the Chef character, which Hayes voiced, was to be axed after Hayes left over the show's satirising of religion. A recent episode parodied the Church of Scientology, to which Hayes belongs. It is not yet clear who is providing Chef's voice, said a spokesman for US TV channel Comedy Central. The series, which has been running since 1997, tells the story of four boys in the dysfunctional Colorado town and regularly deals with sensitive subjects and satirises famous figures. A synopsis of the new episode titled The Return of Chef states that the boys notice "something about Chef that seems different. When Chef's strange behaviour starts getting him in trouble, the boys pull out all the stops to save him." 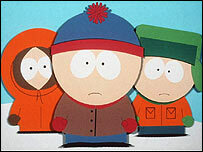 Hayes left South Park last week, saying the show was insensitive to "personal spiritual beliefs". "There is a place in this world for satire but there is a time when satire ends and intolerance and bigotry toward religious beliefs begins," he said. Co-creator Matt Stone said Hayes would be released from his contract and had the best wishes of the South Park team. Stone said: "In 10 years and over 150 episodes of South Park, Isaac never had a problem with the show making fun of Christians, Muslims, Mormons or Jews. "He got a sudden case of religious sensitivity when it was his religion featured on the show." In a recent episode, one of the gang, Stan, did so well in a Scientology test that church followers thought he was the next L Ron Hubbard, the late science-fiction writer who founded Scientology. Hayes did not take part in that episode, Trapped in the Closet, which was first broadcast in the autumn. 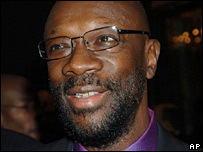 A planned repeat scheduled for last week was cancelled at the last minute in favour of two repeats featuring Isaac Hayes as Chef.